Vice Presidential Candidates Spar Over Medicare : Shots - Health News Fact checkers have raised some flags about some of the claims the candidates made regarding Medicare. Ryan tried to insist that his Medicare plan is bipartisan, while Biden at one point may have confused Medicare with Medicaid. 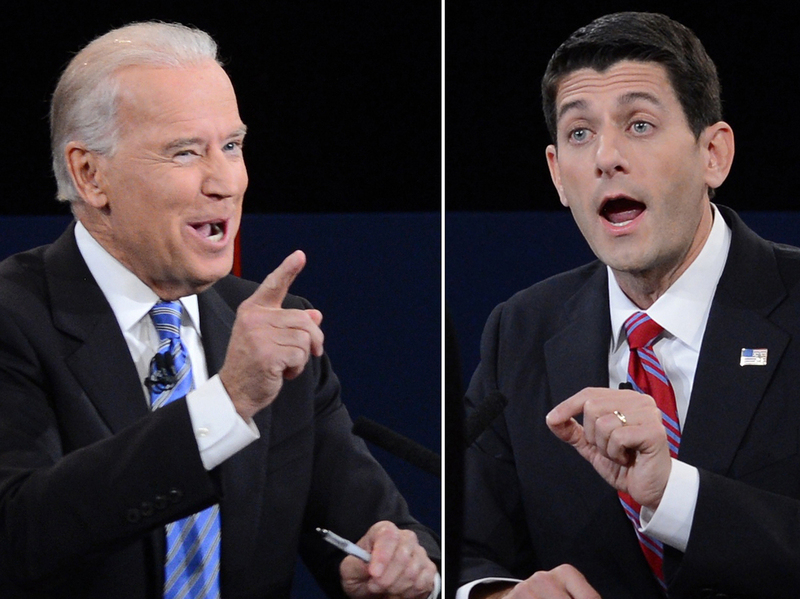 Vice President Biden (left) and Republican vice presidential candidate Paul Ryan during Thursday's debate. It's hardly surprising that Thursday night's vice presidential debate in Danville, Ky., would feature a spirited debate about Medicare. GOP vice presidential nominee Paul Ryan is the author of a controversial Medicare proposal that Democrats have been campaigning against for more than a year now. But fact checkers have raised some flags about some of the claims the candidates made. For example, here's Joe Biden, delivering the Democrats' favorite attack line against the GOP plan: "Their ideas are old and their ideas are bad, and they eliminate the guarantee of Medicare." This is actually largely true. What Biden was using here is shorthand for the way Medicare is structured today, which is a guaranteed set of benefits that continue to be guaranteed no matter how much they cost. What Republican challenger Mitt Romney and Ryan are talking about is giving Medicare recipients a fixed amount of money instead, which might or might not be enough to pay for the benefits Medicare currently provides. So in that sense, the Republican plan does eliminate Medicare's current guarantee, although Medicare as a program would continue to exist. Ryan tried to insist that his Medicare plan is bipartisan. "It's a plan I put together with a prominent Democrat senator from Oregon," he said. But while Sen. Ron Wyden, D-Ore., did produce a policy paper with Ryan last December, it has not yet been turned into legislation that he can support. In fact, Wyden voted against the version of Ryan's House budget that came to the Senate floor this spring, and he took Romney to task when he named Wyden as a partner in the Medicare effort. Wyden was quick to respond again when Ryan tried to make him an ally during the debate. "The Vice President is right," Wyden wrote in a post on his Facebook page. "Romney Ryan moved the goal post on Medicare and I strongly oppose their plan because I believe it hurts seniors." Ryan didn't confine his health care claims to Medicare. He also struck out against the 2010 Affordable Care Act. "Look at all the string of broken promises," he said. "If you like your health care plan, you can keep it. Try telling that to the 20 million people who are projected to lose their health insurance if Obamacare goes through." This number, however, is one Republicans have been taking way out of context. It's the number the Congressional Budget Office says could no longer have employer-provided health insurance when the law is fully phased in, under the worst-case scenario. The more likely number is closer to 3 to 5 million, CBO says. Now, a lot of those people are likely to get insurance other ways, probably ways they will prefer. This includes people who are working solely to keep insurance; they may want to start their own business, or they may want to retire. Overall, the CBO says the law will boost the number of people with health insurance by about 30 million. Not all the misstatements were made by Ryan, however. For example, there was this comment from the vice president when Ryan complained about a panel that could potentially ration care: "You know, I heard that death panel argument from Sarah Palin. It seems every vice presidential debate I hear this kind of stuff about panels." Except that while Palin was indeed active in complaining about "death panels," that didn't start until the summer of 2009; nearly a year after her debate with Joe Biden. Biden also at one point suggested that under Ryan's budget, "he will knock 19 million people off of Medicare." If Ryan looked a bit surprised by that, it's because the vice president most likely meant to say Medicaid, not Medicare.